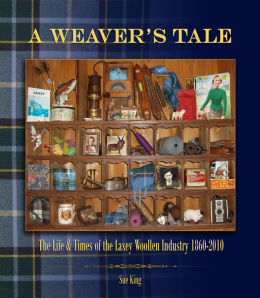 Come join us at the Laxey Woollen Mills, Hodgson Loom Gallery for a special event to celebrate the launch of the fascinating new book 'A Weaver's Tale - The Life & Times of the Laxey Woollen Mill Industry 1860 - 2010'. You won't want to miss the concurrent exhibition, offering the opportunity to explore detailed aspects of the book with the aid of rare photographs, archive documents and historic machinery. The exhibition will open on May 5th and run through May 22nd, Monday through Saturday, 9:00am - 5:00pm. Click Here to order your copy of the book NOW! Prepare to immerse yourself in this colourful story written by local writer, Sue King, as she brings to life a tale of skilled craftsmanship and enterprise. Including larger-than-life personalities and set against a backdrop of Laxey history, this story reveals a side to the village other than trams and mines! The resulting book is easy-to-read, and liberally illustrated, featuring dozens of colour and black and white photographs. 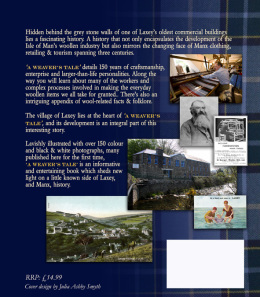 'A Weaver's Tale - The Life & Times of the Laxey Woollen Industry 1860 - 2010' will be on sale at the Laxey Woollen Mills; MostlyManx shop, Nelson Street, Douglas as well as all good Island bookshops beginning May 5th, 2010 OR click here to order your pre-release copy NOW! RRP £14.99 (plus shipping when applicable).